It is midmorning in the air traffic control tower at the San Antonio International Airport, and it seems that everything that could go wrong has. Planes are straying from their designated take-off and landing patterns; one recently departed plane is being forced to return to the airport; and emergency vehicles are being called to the sides of the runways. In the tower, the matter-of-fact voices of the air traffic controllers show no hint of panic, although some visitors feel their blood pressure rising. Of course, this is just a simulation, and some proud parents in the control room are beaming. It is graduation day for the latest crop of students at Lowndes County’s Wiregrass Georgia Technical College Advanced Air Traffic Control (ATC) class, and the course instructors have invited parents and a few others to have a look at the central element of the ATC learning process: a realistic $750,000 control tower simulator that can replicate the features of a number of airports, as well as the myriad problems an air traffic controller may face at any given moment. One of those in the simulator control room is Reese Pitts, 22, a Valdosta native 10 months into the ATC program and two months away from his graduation. For Pitts, the San Antonio exercise is part of the serious business of stepping into the job of an air traffic controller, with its $45,000 starting salary. “This simulator is our main training tool, and it is the best,” says Pitts. “I don’t yet have a job waiting on me, but I feel strongly we’ll get our jobs when we graduate. I’m sure the people in front of us will go to work in the field and create a path for us.” To get an idea just how seriously motivated these students are, one need only look at the cost of this one-year course: $50,000, by far the most expensive tuition for any single course in the Technical College System of Georgia (TCSG). The demand from the Federal Aviation Administration (FAA) for air traffic controllers is expected to accelerate as its workforce ages, and Wiregrass Tech is the only institution in the nation with a one-year course and the sophisticated simulator. Turning out air traffic controllers is being accomplished at Wiregrass thanks to an unusual partnership between the technical college and Advanced ATC, a private company formed by three retired air traffic controllers, including John Fisher, the firm’s executive vice president for business development. A short walk across the Wiregrass Tech campus will take a visitor to the lobby at the office of the college’s president, Dr. Ray Perren, where a large trophy marks the school’s recognition as Technical College of the Year for 2010. 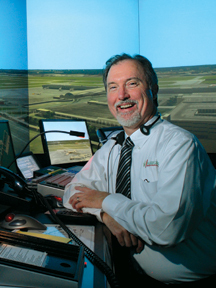 Perren believes programs like the air traffic controller with its coursework and high job placement rate were contributing factors to the school’s selection by the Technical College System of Georgia. “Last year, 97 percent of our students either continued their education or were employed within 12 weeks of their graduation,” Perren says. Wire-grass Tech has another unique partnership with the community’s Moody Air Force Base, an important economic engine with a $200-million annual contribution in jobs and contracts to the region. While the simulated airport drama was unfolding, a couple of exits down Interstate 75 at the James H. Rainwater Conference Center, 150 people were attending an export symposium sponsored by the Valdosta-Lowndes County Industrial Authority designed to help local companies open foreign markets for their products. While the exporters and would-be exporters were gathering at the conference center, inventors from Lowndes County were preparing for a meeting of their own that evening. There are more than 75 patents held by locals, and an untold number of people who have ideas they might like to turn into patents, as well as cash. The inventors want to form a local chapter of an organization that can help them take those products from idea to reality. With Valdosta State University, Moody Air Force Base and the South Georgia Medical Center combining to generate an annual local economic impact of more than $1 billion and Interstate 75 cited as a key factor in Lowndes County’s $2.17 billion in annual retail sales, coupled with the county’s status as having the highest pull factor in the state (a figure that measures the retail dollars spent by out-of-county buyers), there was a time when some believed the community was well insulated against the effects of an economic downturn. “One economist even said we were the only recession-proof community in Georgia, with all the economic engines we have,” says Brad Lofton, executive director of the Valdosta-Lowndes Coun-ty Industrial Authority. “What we have found is that we are not immune; we are hurting just like everyone else.” Still, the Lowndes County unemployment rate has hovered around 8.5 percent, far better than the state average, and several 2010 announcements hold the promise of lowering that number even more. CCA is the fifth largest penal system in the country, behind Florida, Califor-nia, Texas and the Federal Bureau of Prisons, according to Lofton. “They have about 20,000 employees across the country,” he says. Original projections had the PCA construction project being completed by the end of 2011. “But they are eight months ahead of schedule,” says the Industrial Authority’s Lofton. “What they are doing is putting in a biomass conversion that is going to make them 100 percent self-sufficient on energy.” And the improvements will preserve 350 higher-paying jobs, adds Lofton. The construction payroll for the im-provements has been estimated at $75 to $100 million. “We think the capital investment is the largest ever for the county, by a factor of two,” Lofton says. In December 2010, Valdosta completed a yearlong celebration of its 150th anniversary as a city, with many here finding lasting connections between those early days as a village on the railroad and the modern city on Interstate 75. Actually, the original Lowndes County seat of government was Troupville, but when a proposed rail line was set to miss that town, leaders simply packed up and moved four miles east and rechristened their county seat Valdosta. The move put the town on the railroad and, as it turned out, on the map. Valdosta has always cherished its visitors, according to Sementha Mathews, public information officer for the city and an active participant in the 150th anniversary celebration. “You would think we would have participated in the Civil War, but Valdosta was always a place of refuge during that war,” Mathews says. No one appreciates those modern-day visitors more than Lowndes County Commission Chairman Ash-ley Paulk, who saw his community’s Special Purpose Local Option Sales Tax (SPLOST) help pay for the recently completed $30-million Lowndes County Judicial Complex and a $20-million jail expansion, as well as a new fire station and emergency center. “We have done a lot under the SPLOST,” he says. Lowndes County’s population is projected to have grown by 15,000 during the just-completed decade, and that is having an effect on the political structure. “We have a small county commission for a county our size,” Paulk says. “We’re trying to expand our commission from four to six members.” Voters approved the idea by referendum last year, and local leaders are asking the legislature to take the necessary steps to put the issue on the 2012 ballot to formally complete the process. “We felt like we needed more eyes and ears to serve over 100,000 people,” he says.